The Patagonian Andes have become universal symbols of exotic beauty and of adventure. San Martin de los Andes, an idyllic enclave set at the foothills of the Chapelco Ski Resort and on the northern shore of Lake Lacar, has blossomed as one of its foremost exponents. Who could have told me that beyond the unmatched attractiveness of its mountains, woods, rivers and lakes, that offer so many alternatives for outdoors sports and enjoying nature, you can also find great indoor gourmet dining? Welcome to Monica Due, a restaurant owned and hosted by Paola and Mario, a couple from Bologna that set foot in these magnificent land only three years ago, for the delight of locals and tourists alike. 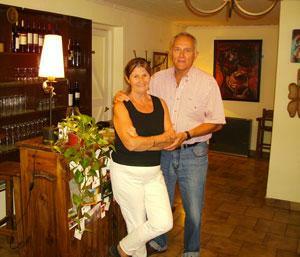 Before coming to Argentina they lived in Costa Rica where they owned the famous Monica Restaurant Italiano. Monica is the name of their daughter who now lives in the USA. Just when she thought their parents were retiring, they announced their surprise move to Patagonia. Monica, her husband, and their grandson visited them in San Martin de los Andes earlier this year. After a full day of outdoors activities, whether it is winter skiing, or summer fishing, hiking or biking, hardly anything will be more comforting than home-style gourmet pasta. At Monica Due, homemade pasta and quality service are trademarks. From the moment you arrive, Mario will make you feel at home, help your select a nice Argentinean wine from the cellar, and will take your order from the excellent Menu available. Paola will herself prepare your order to perfection. You will find a great variety of pastas including lasagna alla Bolognese, ravioli stuffed with cheese and eggplant, fettuccine with wild mushrooms or lamb stew sauce, or traditional fettuccine Parmigiana, among others. If you really want to treat yourself to the best of the best, try the Polenta or the Beef Stew. And don’t forget to round out your meal with the delicious Tiramisu, chocolate mousse or Strudel. Even if all you want is to go out to a restaurant for a nice meal, trust me, your experience will be that of having been invited to the house of the best cook and host in Italy. Italians have different ways of doing pasta, depending on the region and cultural traditions, but the homemade pasta that enjoys uncontested recognition as Italy’s finest is that of Emilia-Romagna and mostly of Bologna, the birth place of tagliatelle, cappeletti, tortelloni, tortelli and lasagna. Paola, your host and pasta hand-maker, is from Bologna and at Monica Due you will enjoy true “Pasta Italiana”. Buon appetito! It is always better to make a reservation because Monica Due is a relatively small restaurant that tends to get crowded during high season. The prices are very reasonable and the quality is excellent. The best Italian restaurant ever. Paola and Mario make the best italian food in my opinion, but over that is the friendship and cordiality what make “monica due” in the best. PAOLA Y MARIO,gracias por hacerme sentir como en casa,ya que vuestra pasta es de la misma calidad y sabores que me hacia mi vieja,como espero mis vacasiones para estar junto con ANA disfrutar esos manjares.ciao carisimi bi volio bene.TONY Y ANA. Hola Amigos de Monica Due, la semana pasada cene ahí, una amiga preguntó en la calle “donde están las mejores pastas?” y una señora nos dijo “de verdad la mejor pasta en San Martín está en Monica Due” nos aconsejó muy bien, la mejor pasta de San Martín, vino delicioso, tiramizú espectacular y un rico limoncelo. Los dueños encantadores, muy cálidos, el lugar acogedor y el detalle fué escucharlos hablar en italiano, hasta se me calleron las lágrimas de nostalgia… Grazie Monica Due…. Un abrazo desde Chile. This page rendered in 0.605 seconds.